Laser Therapy has been approved by the FDA. It is a Laser Therapy treatment that utilizes specific wavelengths of light that affect muscles and tissues. Cold Laser Therapy expedites the healing process and is used primarily for patients suffering from an assortment of acute and chronic conditions. The main objective of "Cold" Laser Therapy is to help eliminate pain, swelling, reduce spasms, increase functionality and much more. 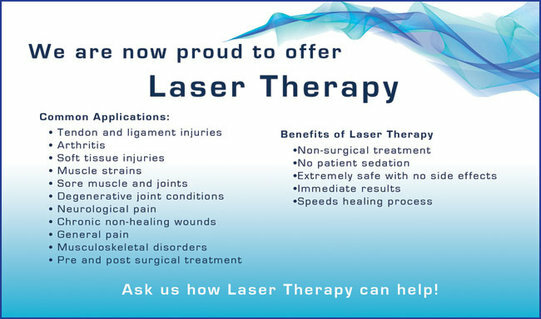 Cold laser therapy produces a beam of light that is applied over the injured area to stimulate healing. There is no pain with the treatment. When laser light is absorbed by a living tissue, it triggers biological reactions in the cells. Chemical substances are produced, released and carried by the blood and lymphatic flow to other parts of the system. In this way the effects of cold laser light may not be only local, but can also achieve wide systematic physiological responses, including reduction in pain by causing production of natural pain killers called endorphins. Inflammation is reduced by suppressing inflammatory enzymes that create swelling, redness, pain and heat. It can also enhance lymphatic drainage, which increases circulation and speeds healing. Cold laser therapy helps release tight muscles that create chronic pain, joint problems and decreased mobility and promotes faster bone repair by stimulating fibroblastic and osteoblastic proliferation. How does the Cold Laser Therapy compare to other laser therapies? Our Laser therapy system utilizes a high power, Class IV, “soft,” “cool,” or “cold” laser, which has longer wavelengths than Class I, II, III systems to promote rapid reduction of pain, accelerate healing time, and accelerate tissue regeneration and repair. Cold lasers are called “cold” because they do not induce any temperature change in the body’s tissues. “Hot” lasers have shorter wavelengths, which have catabolic effects that can deliberately destroy tissue in cauterizing and surgical applications. The cold laser has been called “The Therapy” of the 21st century. In more than 2,500 scientific research studies on laser therapy, there is verification of the clinical value of laser therapy with no recorded negative side effects. This versatile tool is totally safe, painless and medication-free, non-toxic, and with virtually no negative side effects. Cold laser therapy has stimulative effects rather than destructive ones. It compliments the orthotic deprogrammer protocol of treatment for TMD (Jaw). Clinical applications of the cold laser have included acute and chronic pain reduction from many etiologies, inflammation reduction, enhanced tissue healing, and cell regeneration. Extraordinary results when applied to head, neck and shoulder regions of the body. The results have shown very rapid pain reduction and accelerated recovery times, far exceeding conventional methods. Numerous clinical studies and research trials have been conducted on the beneficial effects of laser therapy for a whole host of clinical conditions. The following is a simplified list of the more widely studied biological effects of Laser Therapy. Laser Therapy relieves pain through several different biological mechanisms. 1) Laser Therapy blocks the pain signals transmitted from injured parts of the body to the brain. This decreases nerve sensitivity and significantly reduces the perception of pain. 2) Laser Therapy also reduces pain by decreasing inflammation and swelling. 3) Laser Therapy also reduces pain by increasing the production and release of endorphins and enkephalins which are natural pain-relieving chemicals within our bodies. Laser Therapy causes the smaller arteries and lymph vessels of the body to increase in size – a mechanism called vasodilation. This increased vasodilation allows inflammation, swelling and edema to be cleared away from injury sites more effectively. Vasodilation of lymph vessels also promotes lymphatic drainage which also aids in this vital healing process. Bruising is often resolved more quickly as a result of this particular biological effect. Laser therapy stimulates the production of fibroblasts which are the building blocks needed to create collagen. Collagen is the essential protein required to replace old tissue or to repair damaged tissue. Because of this effect Laser Therapy is effective at treating open wounds and burns. Photons of light emitted by therapeutic lasers penetrate deeply into the tissues of the body to stimulate the production centers of individual cells. This stimulation increases the energy available to these cells causing them to absorb nutrients and expel waste products more rapidly. This dramatically accelerates the repair of injured tissue leading to faster tendon, ligament and muscle healing. Laser Therapy significantly increases the formation of new capillaries (tiny blood vessels) within damaged tissues. With more capillaries bringing more blood to the injury site healing is sped up, wounds are closed more rapidly and scar tissue formation is reduced. Laser Therapy also has a profound impact on individual blood cells that pass through the laser beam during treatment. The laser light significantly increases the oxygen and nutrient load capacity of the red blood cells (RBCs). This allows for increased metabolic activity and production of certain specific enzymes. Both of these effects can be felt across the entire body and are not just limited to the area exposed to the laser light. Laser Therapy reduces the formation of scar tissue (fibrous tissue) following tissue damage related to cuts, burns and surgery. Laser Therapy is able to reduce this formation by speeding up the healing process, improving the blood flow to the injured area and more effectively carrying away waste products – all are mechanisms mentioned above. Faster healing always leads to less scar tissue formation. Photons of laser light are directly absorbed by chromophores (molecular enzymes within cells) that are embedded within most cells of the body. This laser light absorption activates a specific enzymatic process that triggers the production of ATP. ATP (adenosine tri-phosphate) is the single most important form of energy that powers ALL chemical reactions within ALL cells of the body. Higher energy production leads to faster and more efficient function – especially true of immune-specific cells that are exposed to Laser Therapy. This improved efficiency aids the immune system in fighting off undesirable microbes and pathogens. Laser Therapy is also an effective alternative to traditional Acupuncture treatment. Traditional Acupuncture delivers therapeutic effects through the mechanical stimulation of “Acupuncture Points” throughout the body. This is achieved by piercing the Acupuncture Points with needles and then twisting the needles by hand, tamping them or connecting them to electrical stimulation devices. Laser Therapy may be used to stimulate the same Acupuncture Points without the need for invasive needling or similar mechanical stimulation. The BMJ clinical evidence recommendations for tennis elbow 2011 now include LLLT. Chow RT, Heller GZ, Barnsley L.
Castle Hill Medical Centre, 269-271 Old Northern Road, Castle Hill, NSW 2154, Australia. Efficacy of low power laser therapy and exercise on pain and functions in chronic low back pain. Gur A, Karakoc M, Cevik R, Nas K, Sarac AJ, Karakoc M.
Physical Medicine and Rehabilitation, School of Medicine, Dicle University, Diyarbakir, Turkey. The study was aimed to find out if low power laser therapy (GaAs laser) was useful for a therapy on chronic low back pain. They studied 75 patients; (25 patients laser alone, 25 patients laser and exercise, and 25 patients exercise alone). CONCLUSION: In the treatment of chronic low back pain, low power laser therapy was an effective method in reducing pain and functional disability. CONCLUSION: The authors identified 16 randomized controlled trials that included a total of 820 patients. They did a systematic review and meta-analysis of the trials to determine the efficacy of LLLT in neck pain. They showed that LLLT reduces pain immediately after treatment in acute neck pain and up to 22 weeks after completion of treatment in patients with chronic neck pain. Simunovic Z, Journal of Clinical Laser Medicine and Surgery (Aug. 1996) 14(4):163-167. CONCLUSION: This study was performed on >200 patients that were suffering with low back and radicular pain, skeletomuscular ailments, headaches, facial pain, myogenic neck pain, shoulder and arm pain, epicondylitis, tenosynovitis, and achilles tendonitis. They used various LLLT methods which included; infrared 820-830 nm continuous wave, 632.8 nm visible red, and 904 nm pulsed emission on “trigger points” and focal pain points due to ischemic conditions. They observed spontaneous or induced pain decreased or even disappeared by movement, mobility was restored, rigidity decreased, and microcirculation improved along with improvement of oxygen supply to hypoxic cells in the treated areas and removal of collected waste products.Results measured according to VAS/VRS/PTM: in acute pain, diminished >70%; in chronic pain >60%. They also concluded that LLLT (Cold Laser) may be used by its self or as an added supplement to other therapeutic procedures for pain treatment. No negative effects were noted with LLLT and the use of analgesic drugs could be reduced or completely excluded. Injured cells and tissues have greater affinity for LLLT than healthy cells and tissues. LLLT in the treatment of inflammation, pain and healing is a highly integrated process, but the author separates those processes categorically for identification. Acute Inflammation Reduction (flowchart provided in the original article) – After injury, tissues initiate a series of biological responses and cellular membrane reactions which manifest in a combination of edema, inflammation, pain and functional debility.LLLT mediates by: (1) Stabilizing cellular membranes; (2) Enhancing molecule ATP production and synthesis; (3) Stimulating vasodilation via increased Histamine, Nitric Oxide and Serotonin; (4) Accelerating leukocytic activity; (5) Increasing Prostaglandin synthesis; (6) Reducing Interleukin-1; (7) Enhancing lymphocyte response; (8) Increasing angiogenesis; (9) Modulation temperature; (10) Enhancing superoxide dismutase levels; and (11) Decreasing C-reactive protein and neopterin levels. Pain Reduction(flowchart provided in the original article) – Evidence justifies a conclusion that LLLT reduces pain by combination of processes: (1) Increase in b-Endorphins; (2) Blocked depolarization of C-fiber afferent nerves; (3) Increased nitric oxide production; (4) Increased nerve cell action potential; (5) Axonal sprouting and nerve cell regeneration; (6) Decreased Bradykinin levels; (7) Increased release of acetylcholine; and (8) Ion channel normalization. Richard Martin, BS, CLT is a photobiologist specializing in laser therapy and holds the position of Director of Science at MicroLightLaser, a subsidiary of Innovative Medical Group Corporation in Santa Monica,CA. He has taught laser physics and photodynamics for eight years. He has served as manager for several biomedical design and service facilities and participated as lead researcher for biomedical devices involved in emergency cardiac care, warmed intravenous fluid therapy and laser therapy. Richard has participated in medical clinical trials for 15 years as a clinical trial analyst and contributing clinician. They indentified 11 out of 88 randomized controlled trials that included 565 patients with chronic joint disorders that were using an appropriate and acceptable method of treatment procedures. They also added that there should be caution with treatment procedures and trial design for interpretation of the results. CONCLUSION: Cold Laser (LLLT) gave significant reduction of pain and improvement in health status in chronic joint disorders. A forty (40) year old woman presented at the Abe Orthopaedic Clinic suffering with pain in the low back and left hip and leg for 2 years. MRI showed a ruptured disc in the last lumbar disc (L5-S1). Her condition failed to respond with convention treatment methods including; NSAIDS (Non-steroidal anti-inflammatory drugs), lumbar/pelvic traction, dural block anaesthitic injections. Cold Laser (LLLT), GaA1A diode laser with 830 nm wavelength, 60 mW, was used on the patient as an outpatient therapy. CONCLUSION: The patient’s condition dramatically improved which was demonstrated by motility exercises. A follow-up MRI confirmed the improvement with significant results showing a normal condition of the previous lumbar disc herniation at L5-S1. Shigeyuki Nakaji, M.D., Ph.D., Chiyuki Shiroto, Misako Yodono, Takashi Umeda, Qiang Liu. The authors noted, under “Background Data”, that the use of LLLT (cold laser) for chronic pain attenuation has been reported in international literature for over 20 years. The study was assessing the long term effects of Cold Laser (LLLT) through retrospective surveys using questionnaires. 1,087 patients were treated with LLLT from April 1992 to August 1995 at the Shiroto Clinic. 662 patients (397 females, 265 males) replied to the questionnaires that were sent to September and October 1996. The treatment method consisted of Cold Laser (LLLT) diode laser system using 830 nm wavelength, continuous wave 60 mW, (which they noted was the most effective wavelength). The total efficiency rating immediately after treatment was 47% in women, and 46.8% in men, at the time of the survey the rating soared to 76.8% in women, and 73.3% in men, which was considered good – excellent. Additional factors were also positive including; physical energy, well-being, general fatigue, emotional stability, and mental vigor. CONCLUSION: Cold Laser (LLLT infarred diode), is considered effective, safe, and side-effect free, therefore making the treatment an ideal adjunctive therapeutic modality for intractable chronic pain and other pain. Photomed Laser Surg. 2008 Apr;26(2):99-105. The author noted in background data that the use of Low Level Laser energy has been recommended for the management of a variety of musculoskeletal disorders. This study tested the efficacy of Cold Laser (LLLT), 810 nm wavelength, continuous 60 nW applied to eight points on the shoulder in patients with frozen shoulder. A total of 63 patients were treated; 31 active laser group, 32 placebo laser group. With the active laser group, there was significant decrease in shoulder pain, a significant decrease in overall, night and activity pain, significant decrease of shoulder, arm, and hand, and significant decrease in health-assessment questionnaire (HAQ sores. Most activity pain scores were tested at the end of 4 weeks, 8 weeks, and 16 week post-radomization. CONCLUSION: Cold Laser (LLLT) treatment was more effective in reducing pain and disability scores than a placebo at the end of the treatment period and at the follow-up period. Hegedus B, Viharos L, Gervain M, Gálfi M.
CONCLUSION: This was a study to examine how LLLT (Cold Laser) 830 nm wavelength, continuous, power 50 mW, with 6 J/per point skin contact, had an pain relieving effect and microcirculatory changes to osteoarthritis in knee pain sufferers. There was a placebo controlled group that was treated with the same appearance laser. Both groups were examined at two weeks and two months after cold laser (LLLT) therapy. Thermography was performed using a AGA infrared camera and checked, circumference, joint flexion, pressure sensitivity, and the visual analogue scale was recorded. RESULTS: Significant improvement in the treated group, with Cold Laser; was found in pain (before treatment [BT]: 5.75; 2 mo after treatment : 1.18); circumference (BT: 40.45; AT: 39.86); pressure sensitivity (BT: 2.33; AT: 0.77); and flexion (BT: 105.83; AT: 122.94). In the placebo group, changes in pain and joint flexion were not significant. Thermographic measurements showed at least a 0.5 degrees C increase in temperature—and therefore an improvement in circulation compared to the initial values. Changes did not occur in the placebo group. The results showed that Cold Laser (LLLT) reduces pain in Osteoarthritis in the Knee and improved microcirculation in the treatment area. Bjordal J M, Couppé C, Ljunggren E.
This study was performed to see if Cold Laser (LLLT) can reduce the pain from tendinopathy in randomized placebo controlled trials. The authors ended up using 13 trials out of 78 studied that met their criteria on treatment procedure and trial design. They concluded that Low Level Laser Therapy does reduce pain in chronic and subacute tendinopathy when a specific does, location, and valid treatment was performed. For more information go to Physical Therapy Reviews, 2001; 6:91-99.
de Paiva Carvalho RL, Alcântara PS, Kamamoto F, Cressoni MD, Casarotto RA. Postgraduate Program in Rehabilitation Sciences , University of São Paulo, São Paulo, Brazil. Call us Today about utilizing the High Power Class IV Laser Therapy on your road to better health!